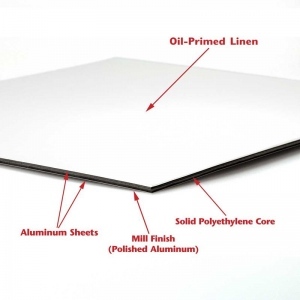 Artefex Allinpanel is a professional panel for oil painting with 100% linen canvas oil-primed in Italy and adhered with BEVA 371 film to a two-sided aluminum composite panel, consisting of two aluminum sheets laminated to both sides of a black polyethylene core. Artefex Allinpanels offer a superior support for painting compared to wood panels because ACM panels have very low response to environmental changes, such as relative humidity (RH) and temperature. Artefex Allinpanel consists of medium texture, oil-primed linen mounted on 3 mm ACM panel with BEVA 371 (mounting adhesive).